Bringing home a new dog is an exciting time. Even for us, as often as we bring new dogs home. But for the dog, it can be a scary time too. Dogs are creatures of habit. They like routine. And a new home is about as far from routine as they can get. 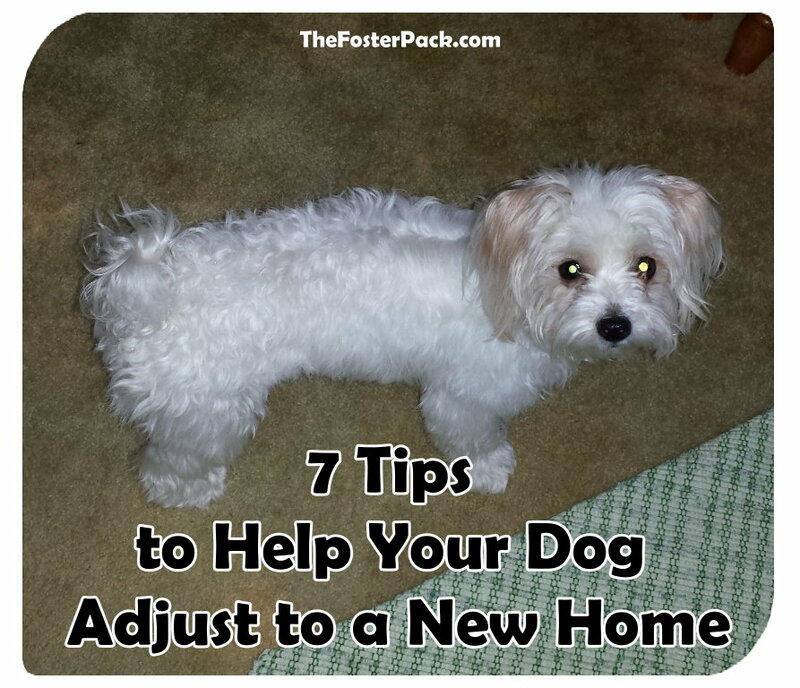 So here are some tips to help your dog adjust to a new home. 1. Stay calm and keep your first couple of days low-key. Don’t plan lots of outings, or have a whole bunch of people over to welcome your dog to his new home. Just keep it casual and let your dog have time to adjust to his new home. Let him explore the house, with supervision of course. Meet his new family and any other pets in residence. Let him explore the outside too. His new play and potty areas. And let him come to you when he’s ready. Don’t force attention on him when he’s visibly stressed. When he comes to you, go ahead and shower with with attention. But let him do it in his own time. A new home and new people can be overwhelming for a dog. His whole life has just turned upside down. 2. Give him his own space. Have a size appropriate [amazon_textlink asin=’B00QAVNWSK’ text=’dog crate’ template=’ProductLink’ store=’fosterpack-20′ marketplace=’US’ link_id=’fbe93c5c-2de0-11e7-b9eb-d3f3579a1719′] all ready for him, or at least a room with a comfy bed where he can go to be alone. We keep new dogs in an [amazon_textlink asin=’B0036WQFQM’ text=’X-pen’ template=’ProductLink’ store=’fosterpack-20′ marketplace=’US’ link_id=’bf68db86-4d51-11e8-8b54-577baa6795db’] or gated into a room for the first couple of days. We know how overwhelming our large pack can be to new dogs. Some dogs, just like some people, need alone time. Other’s don’t need as much. Make his space inviting to him. A comfy bed, blanket and a few toys can go a long way to help your dog adjust to a new home. Especially is he’s just been adopted from a shelter. Dogs love stability and routine. They feel most comfortable when they know what’s coming next. Start your routine the first day you bring him home. Nothing will help your dog adjust to a new home as quickly as getting into a routine. Feeding times, play times, walks and potty breaks. The first few days in a new home can be very stressful for your dog. If he doesn’t want to eat, don’t force the issue. A dog will not intentionally starve himself. He will eat when he gets hungry. Just keep offering him the food at each mealtime. And if you’re switching brands of food, from what he had been eating before, don’t panic if he gets the runs. Some dogs have sensitive stomachs, and changing foods can bring on diarrhea. If possible change his food over slowly by buying a small bag of the food he was eating, and mixing it with the brand you prefer to use. Don’t let your new dog have run of the house for the first few days. After letting him explore his new surroundings, make him stay in the same room with you. Or in his crate or own space when he can’t be supervised. Changing homes, or coming from a shelter, dogs need time to adjust. Keeping them close allows you to put a stop to any undesired behaviors until he settles into his new home. Even a well housebroken dog will most likely have a few accidents in a new home. Keeping a leash on your dog will help to avoid any escape attempts, and allow you to start showing him his boundaries. Some dogs can jump higher than you think, or dig faster than you think. Until you’re sure your dog isn’t going to make an escape attempt, keep him securely leashed. You’d be surprised at how quickly a dog can jump over a fence that you thought would be plenty high. Also beware of how easily it is for some dogs to slip out of collars and harnesses. Especially if they aren’t fitted properly. We have a clip that we use for the first few days, that connects the harness and collar, a [amazon_textlink asin=’B013NNG18U’ text=’carabiner’ template=’ProductLink’ store=’fosterpack-20′ marketplace=’US’ link_id=’74a76b5d-2de1-11e7-a8db-694ccf31607e’] would work good too. The most important thing to help your dog adjust to a new home is patience. Not all dogs will bond quickly with new owners. You will have some accidents, even if they claim he is potty trained. Puppies tend to bond faster than adult dogs. But expect to wait at least two weeks until you see your new dog’s true personality. Just remember soon your dog will feel at home, and will probably act like they run the house!